Expanding on the success of the L Series mixers, Samson has created the L1200, a 12-channel/4-bus professional mixing console. 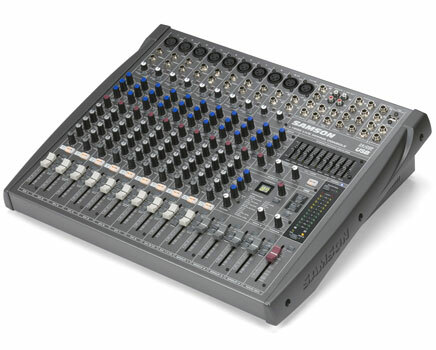 Ideal for smaller venues and more modest applications where you still want all the comprehensive, professional features of a large console, the L1200 bridges the gap between size and functionality. Perfect for installation purposes or as a portable mixer for gigging bands, the L1200 provides 8 mono mic/line channels with studio-quality microphone preamps and 3-band swept mid EQ. In addition, the console features 2 stereo line channels with mic preamps and 4-band EQ, along with 3 aux sends plus an EFX send. The L1200 also offers XLR and 1/4-inch stereo main outputs as well as insert points for mono mic/line inputs, group outputs and stereo main outputs.